New poster released: Magnolia Electric Co.
3-color, all hand screenprinted poster for Magnolia Electric Co.'s show on 7/15/09. Heartbreakers. In a great way. That’s what Jason Molina’s band, Magnolia Electric Co. are, and they’re amazing. I’m pleased as puch to be a part of the summer 2009 Magnolia Electric Co. tour series of posters, (a different limited edition, hand screenprinted poster was produced by artists from all over the country, one poster for each night of the tour) and had such a fun time at the show last night at The Andy Warhol Museum seeing MEC and the super cool Sand Diego band, The Donkeys. Thanks so much again! Sometimes something beautiful goes wrong, in a beautiful way. KABOOM! 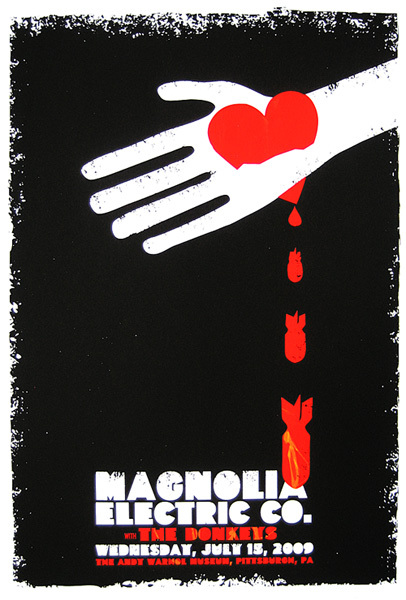 This is my all hand screenprinted poster for the heartbreakingly lovely Magnolia Electric Co. It’s a 3-color, print with heart red, alarm-orange and midnight black inks. The orange ink is swirled into the red throughout the bombs and the text so that each print is unique and different. (Just like you Butterfly.) Edition of just 85, so they’ll go quick. Size: 16w x 22h inches. Paper: acid-free & archival Cougar 100 lb White, cover weight.